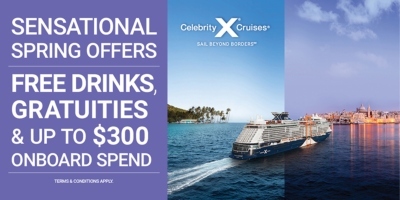 Celebrity Silhouette is the fourth ship in the extremely popular Solstice Class of Celebrity Cruise ships. Famous for their half-acre of genuine lawn grass on the rear of their top-most decks, an afternoon spent outside in the great outdoors is a great way to spend time onboard Celebrity Silhouette as you enjoy the Caribbean sun. Meanwhile, with nine out of ten cabins outward-facing, you can enjoy the views wherever you choose to spend your time. Celebrity are well-known as being a real foodie’s cruise line and Silhouette is no reception, boasting no less than fifteen fantastic restaurants and dining options including 24 hour room service, whatever your budget or mood, there’s something for you each mealtime aboard Celebrity Silhouette. Grand Cuvee is the main dining room onboard Celebrity Silhouette. Spanning two levels and with a grand chandelier the centre of the massive 1428 seating space, guests can enjoy all meals here. The Oceanview Café and bar is also a staple option onboard with an international, relaxed buffet menu each day coving all meals. For those wanting to truly push the boat out, there is also the weekly captain's dinner table here for six exclusively booked guests. For those wanting speciality cuisines there’s no shortage of choice either. Murano is a fantastic French-styled restaurant with a private room bookable, Tuscan Grille an excellent fusion of Italian wines and American steaks, and Qsine a varied selection of anything from all over the world ordered from iPads. For those with a bit of a sweet spot to fill, the Bistro on Five has 12 types of crepes to try as well as Cafe al Bacio and Gelateria for Italian ice cream and coffee. In addition, exclusively for guests staying in AquaClass, the immensely popular Blu serves clean and healthy dishes while the AquaSpa café is located right in the solarium for a quick snack or smoothie without needing to get changed. The same is available by the main pool at the mast Grill and Bar where you can grab a quick snack such as hamburgers poolside. If you want to enjoy a bite to eat outside, the Lawn Club really comes into its own. At The Porch you can tuck into breakfast or lunch and take in the view while at The Lawn Club Grill one member of each table can cook their group’s fish or meat with the help of the resident chef. As well as a lively area with swimming pool, Jacuzzis and sun loungers, Celebrity Silhouette also has an adults-only solarium for those wanting to avoid the crowds and elements. All around silhouette are hammocks and cabanas you can reserve as well as the popular Lawn Club unique to Solstice Class Celebrity cruise ships. This half acre of real trimmed grass is the perfect place for a game of boules or a picnic as you make the most of the weather wherever you’re cruising. Here, you’ll also find the Corning Glass Blowing show with a traditional demonstration. There’s no shortage of entertainment options inside Celebrity Solstice as well with a multimillion dollar art collection onboard to browse when you’re not having a look for tax-free souvenirs in the boutique shops. 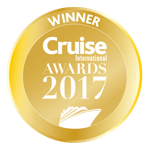 Celebrity is also famed for being a truly enriching cruise experience and so silhouette has a host of daily activities you can join. This could be anything from yoga sessions to painting class- often with various themed sailings for like-minded people. Many events, talks and presentations take place in the theatre which transforms into Broadway-style show house during the night. After taking in a show there are various bars and lounges to suit your mood and musical taste, as well as Fortunes Casino and card rooms. One of the highlights of a cruise onboard a celebrity ship is the spa facilities and Celebrity Silhouette is no different. If staying in AquaClass, you will receive a cabin provided with special bathing products and Aromatherapy diffuser to help you truly relax. AquaClass guests get unlimited access to the Canyon Ranch Spa Club as well as intimate, clean-eating dining in Blu restaurant. For other guests, there is still the option to take advantage of Celebrity Silhouettes spa facilities including Persian Garden steam room, invigorating plunge pool and heated lounges looking out onto stunning views or that days’ destination. There’s also a state-of the art fitness room while for those looking for an extra pampering beauty and massage treatments are available with the famous Canyon Ranch Spa.